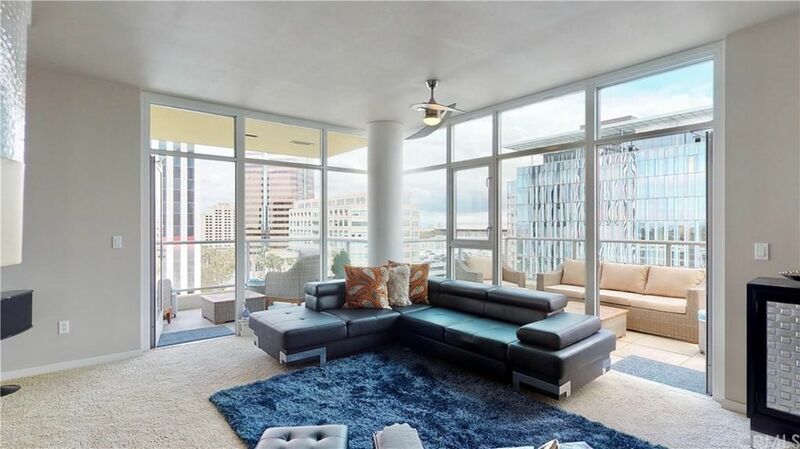 Extremely oversized 1bedroom in luxurious West Ocean Towers, with 2 balconies 1 standard good sized covered and the ultra-rare 2nd (one of the largest balconies approximately 400 sf outdoor living) uncovered perfect for sun bathing and barbecuing! Indoor-outdoor living at it's finest, and makes unit feel so much larger! Floor to ceiling windows showcase unobstructed views of port with amazing sunsets, stunning palm tree-lined Ocean Blvd, and beautiful downtown Long Beach. Freshly painted interior, to match upcoming exterior building upgrade. Kitchen boasts granite counters, stainless steel appliances, and modern wood cabinets. Unit will not last long on the market with its rare large size, outdoor space, prime location and resort-style amenities.Ideal Ocean Blvd location that is walking distance to Metro Blue Line, downtown Pine Avenue nightlife, Pike Outlets with Ferris Wheel and Carousel, Shoreline Village with boardwalk shops and restaurants, and Long Beach Marina waterfront entertainment with year-round activities including the famous Long Beach Grand Prix.West Ocean Towers amenities include 24/7 Concierge, secured entries throughout building and parking, elevators with key fob access restricted to only the 6 units on your floor, 2 fitness centers with modern aerobic and weight machines, sauna, billiard room, personal locker in temperature-controlled wine room, and 2 multipurpose rooms next to outdoor pool/spa for hosting parties, movie room and guest suite.